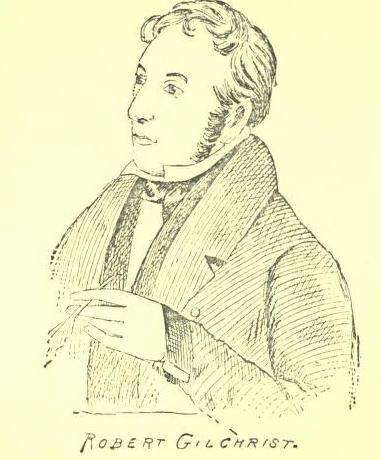 This image of Robert Gilchrist is taken from a print of a painting of the Herbage Committee created in 1840. The likeness has been crudely reproduced in Allan's Tyneside Songs and Readings and in The Monthly Chronicle of North-County Lore and Legend. In the image Robert is seen wearing a blue coat, which may be the same blue coat he wrote in the broadside 'To an old coat', where he describes his fondness for the garment. Gilchrist is depicted holding a quill, a sign perhaps of his notoriety and fame as a writer. "This picture was painted in commemoration of the industry, perseverance and judgement of the Herbage Committee. Letting, September 1st 1840, 100 acres of the town moor on lease for seven years at an extraordinary high rental, part being of the unparalleled price of £5.10.0 per acre, when in the recollection of many only sixpence per acre was obtained - the total rental £510.7.0 will be divided annually by the Stewards of the Incorporated Companies amongst the widows and poor freemen of Newcastle-upon-Tyne. Dedicated to John Hodgson Hinde, Esq. MP, by the freemen of Newcastle as a token of esteem and regard, for his very valuable services on many important occasions. Engraved from an original painting by A. Scaife, now in the possession of Francis Sanderson Esq. Key - William Garrett (Chairman), John Brown (secretary), Robert Gilchrist, James Calbreath, George Belt, John Anderson, Ambrose Hopper, Francis Sanderson (treasurer), William Mickle (vice-chairman). Printed by W & T Fordyce, Newcastle-upon-Tyne. The Newcastle Journal reported on 30 January 1841, "We have just had the opportunity of viewing a very clever picture, at Mr Anderson's, carver and gilder, in Market-street. 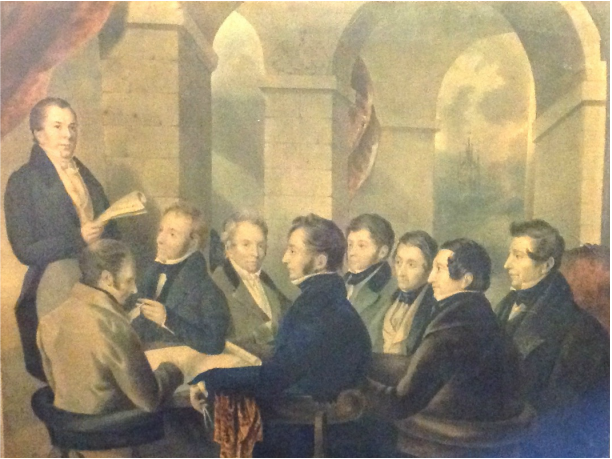 It is an oil painting by Mr Scaife, of this town, composed of nine figures, seated round a table, and grouped with considerable care and judgement, representing seven members of the Herbage Committee of Freemen, r with their Secretary and Treasurer. The scene is supposed to represent the Chairman of the Herbage Committee congratulating his colleagues on the success of their exertions, in letting part of the Town Moor, a few months ago, at the extraordinary rental of £5. 10s per acre, for the benefit of eir poor widows and brother freemen. The splendid frame that surrounds the picture, is surmounted with the arms of the Herbage Committee." The image on the left is taken from a short biography of Robert Gilchrist in The Monthly Chronicle of North-Country Lore and Legend, May 1888, p.234.